New Archie Horror Series Vampironica Is Out for Blood! A cop investigating a series of disappearances links them too an abandon building where a cult of vampires are living in the basement. Naturally, his captain doesn't believe him, so it's up to himand his ex-wife, a vampire novelistto stop the bloodsuckers before they can kill more people. An average entry in the vampire sub-genre. Acting wasn't as bad as I feared (Lance Henrikson, a wonderful actor in this viewer's opinion, steals the show with his usual straight-faced delivery), the script has its moments (wisely writer/director Richard Brandes never takes the subject matter too seriously) and its even got a couple of fun (albeit hockey) gore scenes. The creature effects, from John Carl Buechler, were okay. 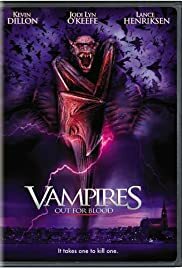 I came in to "Vampires: Out For Blood" expecting the worst but it really wasn't that awful. An average horror film, die-hard vampire fans may enjoy it. 4/10.